WITH OVER 65 YEARS OF EXPERIENCE, GO WITH THE PROS. Arctic Lodges is a premier lodge located in northern Saskatchewan maintaining pride and tradition in being a wilderness lodge. With our team of world class chefs we offer some of the best cuisine you will ever experience. Do you want to reconnect with your clients, build a stronger more loyal team or just a detox from the normal daily digital life? ESCAPE - to one of the most beautiful and pristine, untouched places in the world…that place is Reindeer Lake, located in the north eastern part of Saskatchewan of Northern Canada. Perfectly placed on the northern edge of the Canadian Boreal forest as well as on the edge of the Arctic circle. Arctic Lodges is a fly-in fishing lodge on Reindeer Lake and gives you the best of both worlds. Don’t have your next Canadian fly-in fishing trip ruined by big wind and waves. Reindeer Lake has over 5000 islands, which gives you shelter from the elements as well as providing endless fishable shoreline and structure that gives life to our great fishery. EXPLORE - what is famously known as the #1 body of water worldwide for freshwater trophy fishing, no other fishery can compete with the vast amount of habitat Reindeer Lake offers! At Arctic Lodges, there is no need to spend large amounts of money on fly outs to other lakes when your recognized as the top choice to have a successful trophy fishing trip. With over 2000 trophy fish caught and released each year, Arctic Lodges gives you the best chance for trophy fish in all the four main species - Northern Pike, Lake Trout, Walleye and Arctic Grayling...The Grand Slam of Fishing. DISCOVER - exceptional hospitality that is sure to impress in such a beautiful remote wilderness setting. A team of globally awarded chefs carefully creating your meals during your entire stay. Warm welcoming staff, always available and happy to help you in any way, while being treated like family on a first name basis. Beautifully Log structured main Lodge with all the amenities to keep you happy. Discover the full northern Canadian fly-in fishing lodge experience while relaxing under the night sky, gazing at the canopy of endless stars and dancing northern lights. All while you tell your daily adventures and fish stories to the rest of the group. World record opportunity for anglers. 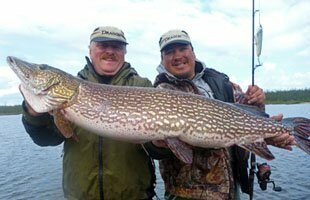 Almost all guests of arctic lodges will catch a “master angler” northern pike, with many more catching pike over the 45” mark and bigger. Each year a few anglers are fortunate enough to bring in a 50” and sometimes even bigger! 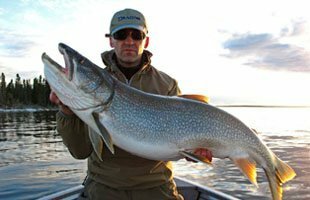 Get ready to be blown away with the size of lake trout that have been caught at arctic lodges. Having some of the largest trout in the world, reindeer lake gives our guests the opportunity at catching a new world record. 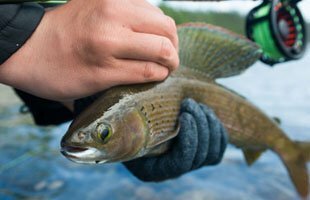 Traditionally, the most popular method of catching arctic grayling is on the fly, in both rivers or on the lake. A 4wt rod is recommended. Grayling will often rise to a dry fly, which makes fly fishing for them a thrill! Insect imitations will provide you with the most success. There are few places on earth where the walleye have as beautiful colouring as on reindeer lake! Once you find one, you’ve found dozens, maybe even hundreds! 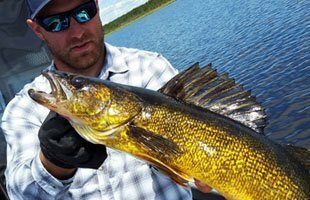 Trolling structured points for walleye is often the easiest way to find them. 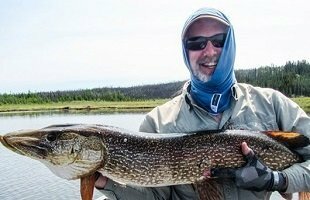 You will see why Arctic Lodges on Reindeer Lake is the perfect location for your Northern Pike fly fishing adventure. Our fleet of boats are equipped with large raised casting decks on 18′ boats that give you plenty of room to throw your fly all day.